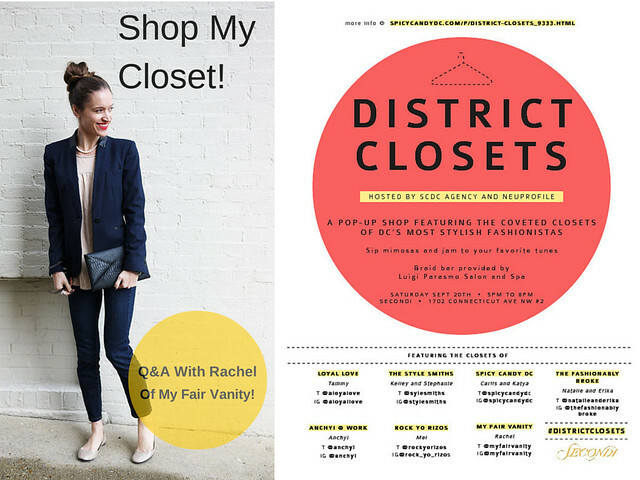 My Fair Vanity: This Saturday: Shop My Closet at Secondi! Anyone who reads this blog knows I am a huge fan of shopping secondhand. If you search for the term "Secondi" on my blog, you will see that almost every outfit I wear has at least one piece from my favorite consignment store. I love to support brands that are treating their workers and/or the environment with dignity and respect (like this one or this one), but if you think about it, it's even more fair and kind to reuse a garment that is already out there, which is why I am excited to be participating in District Closets this Saturday. I hope you can come on out to shop and make merry! The deets: all of you local ladies will have the opportunity not only to shop secondhand selections from Secondi (hand chosen by me and the other girls), but to shop the closets of some of the most stylin' ladies I know, who have been kind enough to ask me to join in on the fun. This Saturday from 5 p.m. to 8 p.m., enjoy complimentary mimosas while browsing District Closets at Secondi in Dupont Circle. Not local? That's OK! Tune in tomorrow for a round up of all of my favorite online places to shop secondhand, from Etsy to Ebay to The RealReal. P.S. Carlis from Spicy Candy DC did a little interview with me yesterday and will be dishing on all of the ladies whose closets you can shop, so I recommend keeping an eye on her blog this week to get an idea of the different styles of the participants and what types of items you will be able to choose from. With a percentage of the proceeds of the event going to charity (I've chosen to benefit Nest), you'll be doing good all over the place!